As per the United Nations Industrial Development Organization, a Cluster is a sectoral and geographical concentration of enterprises, in a particular location facing common opportunities and threats. Cluster Development Approach aims at mainstreaming the private sector and is biased towards the pro-poor growth notion. Under Cluster Development, the economic growth is such that it stimulates opportunities for indigent artisans and industries. Furthermore, Cluster Development Approach creates an appropriate dais by facilitating tools that can make access to the given opportunities effortless. Clusterkrafts core competence over the past 10 years has been facilitating the industry in improving its competitiveness byfabricating an environment for the artisan and the industry clusters for an easy access of adequate pro-poor growth opportunities. Custom cluster basted development programs is the primary tool that makes this access ever so easy. 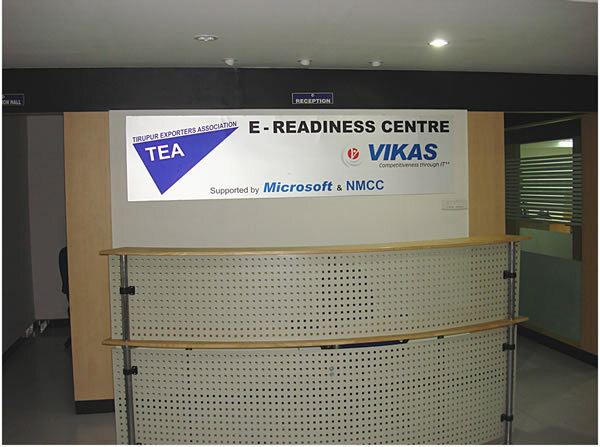 The programs are designed on the basis of felt-need and are aimed at providing absolute support solutions to varied agencies and institutions. The Key areas where support is extended is as follows; developing models for local interventions and networking linkages, facilitating access of clusters to business development and research services. 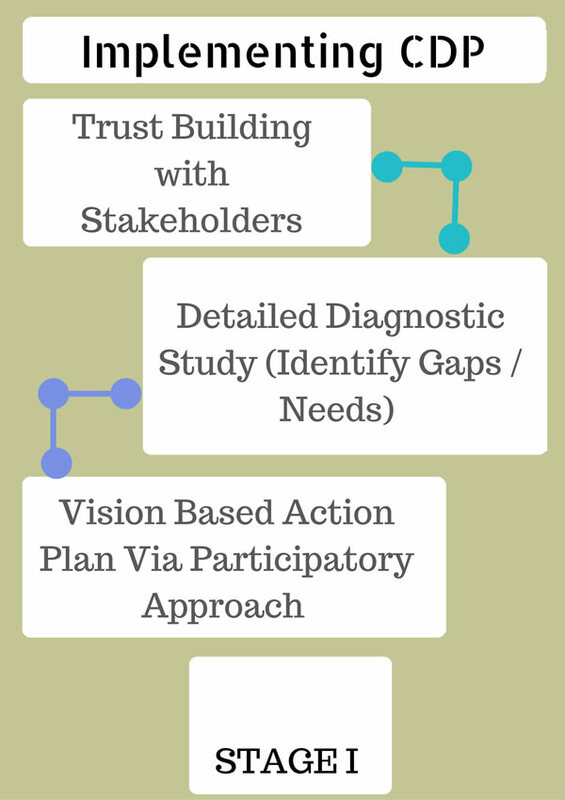 The CDP approach involves a participatory diagnosis of the problems to build up synergies between institutions and entrepreneurs in the cluster. Monitoring and Evaluation (M&E) is a procedure that often refines the execution efficiency of any given project or an activity and helps attain results at an accelerated rate. The primary aim is to improve the current and future management of outputs, outcomes and impact of any given project or an activity. ACDS per say has carved out a niche for itself in Monitoring and Evaluation activities by enabling satisfactory and time-bound implementation of the activities commensurate with project objectives. ACDS has carried out M&E independently and have also partnered with varied state governments and multilateral agencies for the same. The introduction of Small and Medium Enterprise (Development) Act, 2005 is a significant watershed in the history of MSME Development in India.It has not only triggered the change in the mindset of small and medium entrepreneur but has also made upscaling of size and technology upgradation of manufacturing units in substantial numbers with the help of varied Government Schemes an accessible possibility. 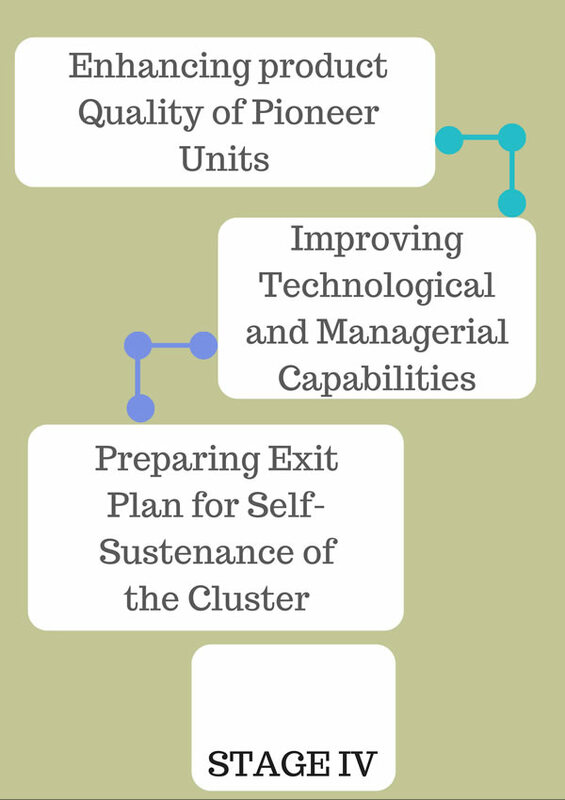 Mapping of Clusters an essential component of any Cluster Development Program. Mapping exercises assists in formulating an adequate database that consists of economic performance measures such as number of employees, wage rates; units within any given cluster; profit margins; and worker & management framework. This activity results into a generation of a systematic database on industrial cluster. Cluster Mapping also facilitates empirically derived cluster linkages; understanding the pattern of cluster, evolution of clusters over time and helps one draw an accurate comparative data for multiple clusters for further analysis. Clusters of identical sectors often face similar threats and opportunities. However, method of deciphering these challenges differ from one cluster to the other due to unique strengths and weaknesses that they possess. It is essential to incorporate learning and best practices of any given cluster with the other in order to enhance the capacity of both the clusters. This symbiosis relation that prevails between varied clusters results in mutual benefit by sharing resources and services. Thus, twining of clusters expands the capacity and improves the performance of both the clusters, simultaneously. 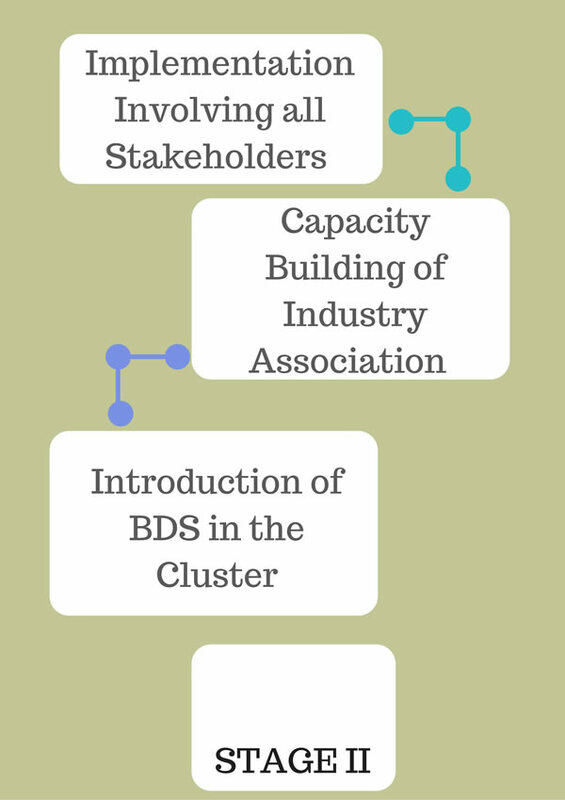 Cluster Development is an all-inclusive process that not only focuses on developing the industry itself but simultaneous development of Forward and Backward linkages. 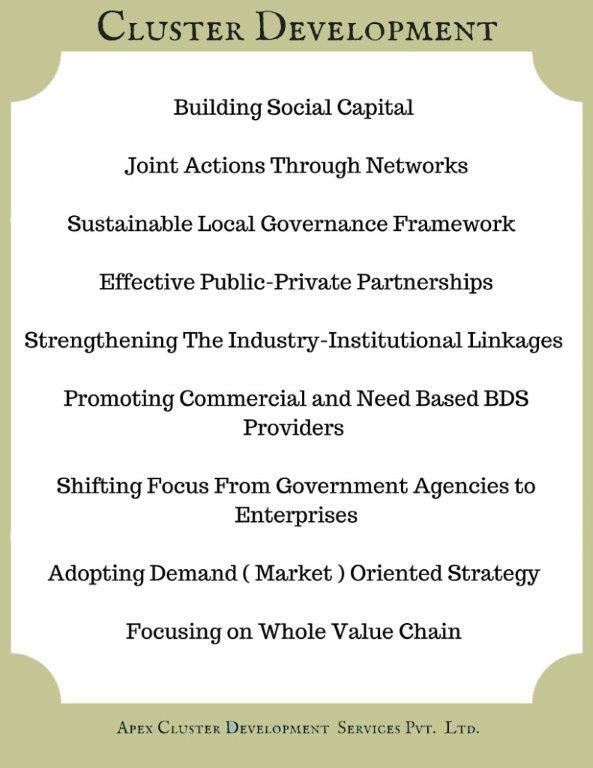 Forward and Backward linkages acts as an essential building block for any industry. Capacity building of business development services provider supports enhancing competitiveness of Micro Small and Medium Enterprises ( MSMEs ). 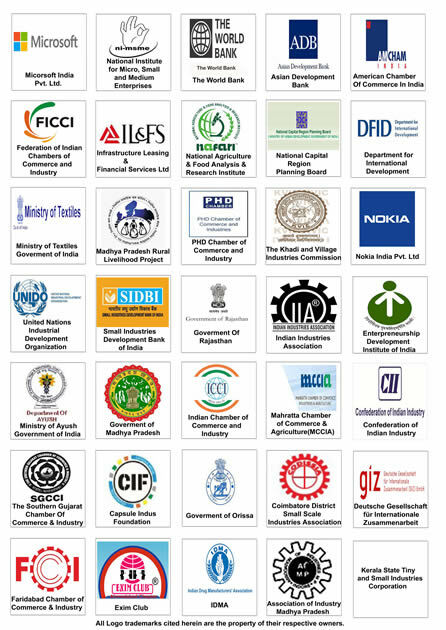 Cluster Development Approach involves strengthening network of manufacturing MSMEs, Suppliers and BDS. This involves facilitating of a suitable platform for exchange of services and generating demand for technology upgradation. Micro Small and Medium Enterprises (MSMEs), by nature have miscellaneous limitations such as the ability to invest in high cost equipment and facilities that will result in the reduction of the operational cost and improvement in quality and productivity of MSMEs . MSMEs due to their size and limited finances are not fully equipped to utilize the said capacity of machineries and facilities alike. Under such circumstances it is possible for the MSMEs to come together and share the initial cost of capital investment and utilize the facility, machineries with mutual partnership thus making them more competitive in the national and internal market. Infrastructure Development is one of the most critical component for any sector Infrastructure Development also refers to technical infrastructure. In any given cluster there are two forms of Infrastructure Intervention: Soft and Hard. Soft Intervention: Soft Intervention refers to any change in the institutional structure that will assure the sustainability and increase the efficiency of any given cluster. Hard Intervention: Hard Intervention are primarily large physical network necessary for the functioning of a modern manufacturing cluster. On an average MSMEs are either unaware of the above given interventions that may help facilitate in their development or may not be able to invest in such facilities due to their limited financial capacity and increased final cost of production. Therefore, government has taken the initiative to assist by investing in infrastructure facilities by sharing the cost of facilities such as roads, drainage, hostels for workers, and common power generation plants through schemes such as Integrated Textile Park ( ITP) Scheme of the Ministry of Textiles , Government of India . Netaji Apparel Park at Tirupur is one such facility established utilizing the support from the Ministry of Textiles. Social Capital is the economic output of social relations in any given Cluster . Social Capital plays a very important role in deciding the competitiveness of any given region. As the name suggests Social Capital like Money Capital is an important competiveness factor of the cluster. Establishing Social Capital is a delicate task where, experience and understanding the given social conditions is essential. Clusterkraft has worked at different level in any given region enabling social capital puts us in a unique position in the given sector.